This is a vegetarian delight………………. I will tell you now, my pet hate is a person that says they are Vegetarian but eats chicken and fish are they vegetables? At times there were the odd extra rooster that needed to be dispatched . This was Dads job. Unfortunately on one occasion my older sister was witness to the massacre. After this she became vegetarian , refusing to eat chicken or lamb or sausages , our staple diet. No matter how she was coaxed (this could include staying at the table for lengthy periods when everyone else had left- not her choice), she refused to let a morsel pass her lips, eyeing Dad like he was a poacher breaching the fence at a game reserve. Truth is we all have a bit of vegetarian in us. I also had a brief fling with Vegetarianism however, I found it hard to stick to my principles in a commercial kitchen . Are Vegetarians a predictable breed ? Some swing between the natural carnivore and a love of something fresh and crunchy………like Ruby..our swinging veggie dog…. 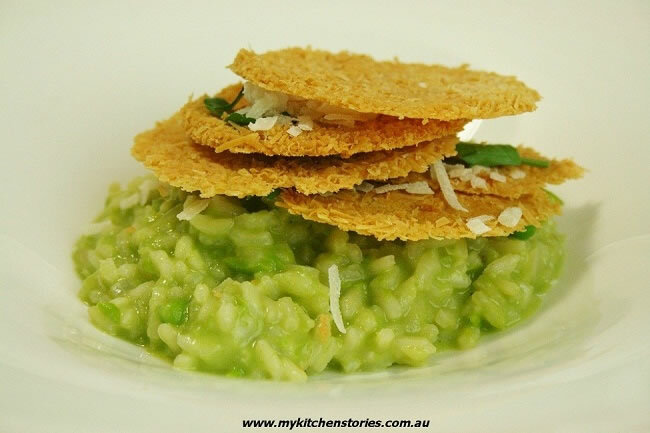 This lovely green risotto could be overlooked as a simple vegetarian option, but believe me the fresh sweet peas just love parmesan and butter…… Risotto takes about 20 minutes to make. Do not be tempted to turn the heat to high or add too many cups of rice, by doubling the amount ( unless you have an army for dinner). This will make enough for about 4 people with a salad . By the way you can add crispy pancetta if you feel this isn’t indulgent enough…………..or you don’t feel like being vegetarian today. Set the oven to 180 C Place the peas and 500 ml ( 2 cups) of stock into a small saucepan and bring to a boil. Simmer on very low, approximately 2 minutes or until the peas are defrosted (over boiling will evaporate a lot of liquid and discolour the peas). Use a stick blender to puree the mixture and set aside ( or use a blender/food processor) Set aside . The first thing to do when making risotto is to get the stock on and heating. Remember that all rice is different and you may need a little more stock at the end so a little extra is a good idea. Heat the oil in a large saucepan. The best saucepan to use is a wide bottomed one. Saute the onions on a low heat until soft then add the rice. Toast it lightly, warming through before starting to add stock 1 cup at a time. Stir the risotto until the liquid is incorporated and add more. When the last of the stock is added, the rice should be cooked when tested, ( do this frequently), not soft and squishy but cooked. If the rice is cooked before the stock is finished set the remainder of stock aside). 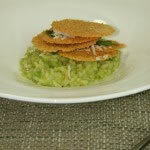 Now add the pea puree, the butter and 1 cup of Parmesan and stir well adding salt and pepper to taste. It should be a nice soupy feeling mixture, ( it will keep absorbing the liquid). Does it need more liquid?....... you can add extra. Stand with a lid on for a couple of minutes. According to the Italians this is the most important step in risotto making. Sprinkle the parmesan in thick circles on a paper lined baking tray. Bake to a light golden colour ( about 10 minutes) and let the circles cool on the tray. 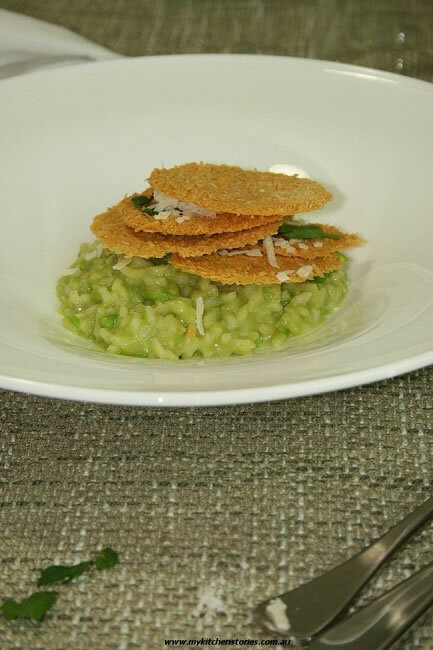 Well….. What a sucess thus risotto was. 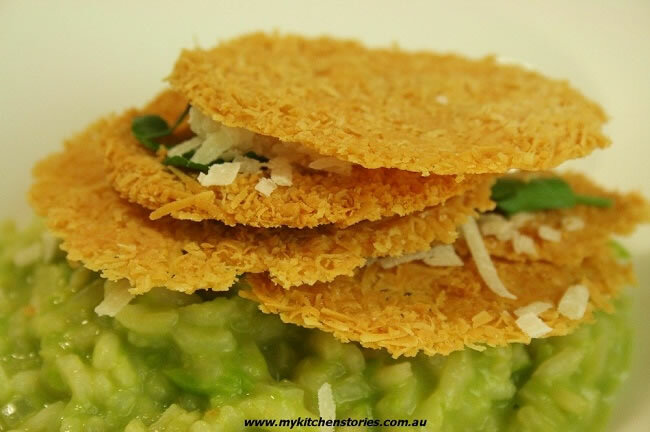 Even more of a sucess was the parmesan crisp. The recipe made 4 large serves, which meant my salad went mainly untouched except by mrs chairman who picked out the baby boc and left the rest. When was I meant to include the wine? I missed that step so I just drank it, it was only fitting as so many other wines have met the same fate…..tonight. The rice you led me to was pretty amazing. I have never cooked risotto before except with aborio rice – how aboring-o! To please my non-vego guests I threw in some balsamic and rosemary glazed goat cutlets. Ever since my first Jamacian Goat Jerk I have fallen in love with this meat. I told them it was lamb until after they ate it all up, Like hanibal lector when he tells you that the delicious meat you just ate was his previous guest. I have pics for a later date. To finish the Gundowring Vanilla ice-cream with fresh strawberries and balsamic glaze was well received. Thank you Chairman, What a lovely night you had. I am so glad to have helped!. I love your use of wine in cooking very innovative. Must try those goat cutlets some time .